In less than 80 school days, my three giant personalities (wrapped up in small bodies) will complete their academic and developmental years and be ready to run hog wild into summer. As much as I would love to be home with them, taking on new adventures that only the warm weather can bring, the reality is that I'm a working mom. I work from home for a portion of every day so I'll get to partake in sandboxes and water balloons. And whether I'm in the office or at home, it's really important to me that my children have a summer of fun, outdoors, activity, and as much magic as I can muster. Are your minds turning to summer yet? We're there. Ready to plan it and live it. 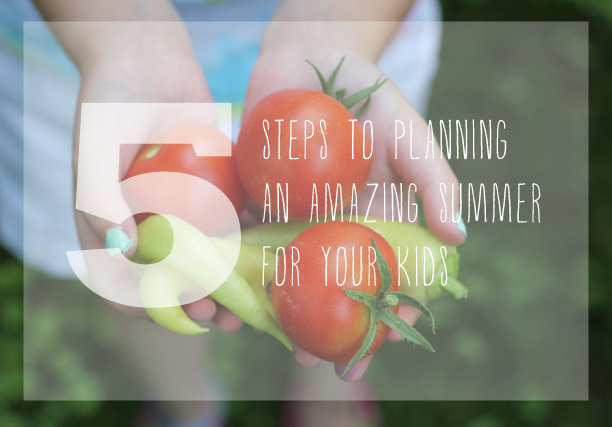 Here are my thoughts on how to make this summer a mutually awesome experience for parents and children. My favorite beginning to the process is the dreaming. This is not necessarily my husband's favorite, so draw from your strengths. I love to have "what if" conversations with three-year olds (you just never know what you'll get) and daydream along with eight-year old minds. Sit down with each child, and brainstorm all the activities they'd like to do. Consider categories like "I want to continue," "I want to try," and "I want to learn." I've discovered fascinating new aspects about my children such as an interest in Irish dancing, a want to learn to stand on one's head, and a desire to make a quilt. Not my favorite aspect, but the process for which my hubs excels. Look at the summer calendar. Actually, print it out and lay it down before you. Mark off all the vacation time that you can as well as times of heavy workload. Be good to parents and children as you look at the time you have allotted. Be sure to find stretches of time for full family activities, individual time with each child, and moments for mom and dad to connect. Those horse riding lessons and the ceramic studio time? Well, they are both beautiful options that can quickly clean out your wallet. Before you make any definite plans or fill out registration forms, decide what's a realistic amount to spend on each child's activities. Obviously most activities become more specialized and expensive as the age of the child increases so try to factor that into your budgetary conversations, too. Prioritize which experiences would be most meaningful to your child and try to hit as many of those as your budget can allow. The chaffeuring from one sport to the next is draining and not the way anyone wants to spend the best days of the year. Right up front, ask parents of your children's friends to join the class and sign on to the same teams so that carpooling can streamline your summer and double the fun at the same time. We rarely sign up for an event or class without calling in a buddy (it's also super helpful with children who are shy to new situations). Remember that the most wonderful childhood memories will happen in simple ways in your backyard or around the campfire. Make a list of all that you want to experience with the kids this summer and commit to doing them (even put making s'mores on the calendar). Make a list of what you as adult want to do and share that with your children (and spouse) to help them get to know your hopes and dreams, too. Consider how your talents and interests can add to their summer experience. Do you have the patience to teach those knitting skills your daughter so wants to learn? Or play tennis with your son? Can you even learn something new together? Here's our summer list from last year, and we're beginning this year's now. February and March are when camps, classes, and teams begin their summer registrations so keep an eye out in your newspapers and media. And in the meantime, let the dreaming begin. I have some extra greatness coming your way this summer with the help of other amazing bloggers. I can't wait to show you!! What's at the top of your summer wish list? Chat It Up: Is the post the most?